Heat grill. In large saucepan, combine all ingredients excepts buns. Bring just to a boil over medium-high heat. Reduce heat; cover and simmer 10 minutes. Remove bratwurst and if necessary, continue simmering onion until tender. Immediately place bratwurst on gas grill over medium heat or on charcoal grill 4 to 6 inches from medium coals. Cook 6 to 10 minutes or until browned, turning once. Drain onion; serve with bratwurst on buns. Bratwurst is German sausage made from seasoned ground veal and pork. Bratwurst is sold cooked, smoked or fresh. Increased exposure and handling make ground meat susceptible to harmful bacteria. To minimize your risk of illness, thoroughly cook bratwurst, sausage and hamburger. 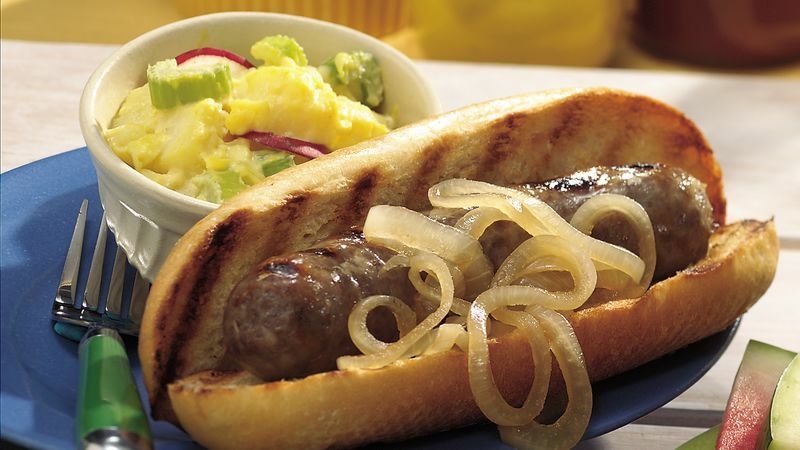 To broil bratwurst, place on broiler pan; broil 4 to 6 inches from heat for 8 to 12 minutes or until browned, turning once.